File synchronization can come in handy in several situations. Think of users with multiple computer systems, e.g. a desktop PC and a laptop or netbook. File synchronization can help them to synchronize emails, bookmarks, spreadsheets and every other kind of data that was created or changed on one of the computer systems. It can also be used for backup services by automatically synchronizing the data of the main computer system with a backup server or external storage device. Free File Sync is an Open Source file synchronization software that's above everything else super-easy to use. The main interface is separated into a left and right column. Directories can be added to each column. The two main actions offered by Free File Sync are to compare or synchronize the directories and the files residing in them. A click on the Compare button at the top will generate a directory and file listing for every directory that has been added to the application. All files and directories are displayed in both columns with a blank row in the opposite column if the file or directory does not exist there. Information about each file including its name, size and modification date are displayed in the table as well. Arrows in the middle indicate the action (e.g. overwrite file in the left column, copy file to the right column) are taken if the Synchronize button is pressed. Statistics for each column are displayed in the footer listing the number of directories, files and the size of the data conveniently. There are also general statistics about the total number of files and folders that would be created if the user would synchronize the files. Several advanced options are available. The file synchronization program supports file filters and several different ways of comparing and synchronizing files. Files are initially compared by name, size and date which can be changed to a file content comparison instead. Four different file synchronization options are provided by Free File Sync as well with automatic synchronization of both sides selected by default. This can be changed to mirror files that reside in the left folder to the right folder, copy or update files from the left to the right folder or a two way synchronization which synchronizes both sides simultaneously. A batch job can be created using the parameters configured before. 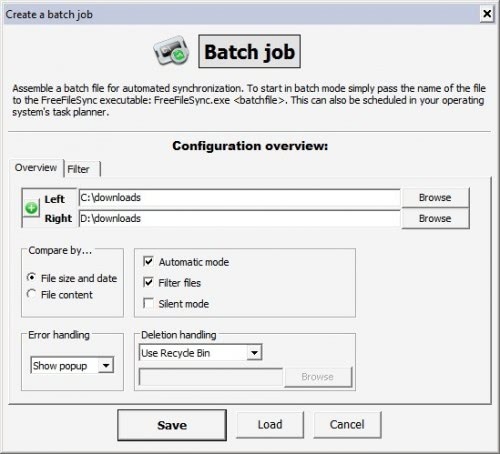 Batch jobs can be executed by starting the file synchronization software with the file name of the batch job as a parameter. This makes it also possible to add the file patronization as a scheduled task in the Windows Task Scheduler. Free File Sync is easy to use. It takes only a few minutes the most to compare or synchronize files and another few to create a batch file to sync files regularly with little to no user interaction. The program is available at the Sourceforge website where it is available for 32-bit editions of Windows and Ubuntu. This is an excellent software. I’ve been using it for months now! Well what is the rate of this software. Can anyone tell me about that ? Malwarebytes is showing Adware Agent.N on install ,it must be a false positive as Sourceforge is normally clean ,any ideas? ?